Often I am told that I am fortunate to be married to a man who is flexible with meals and will eat anything that I cook. While I do often prepare a different dinner for each of us (since he does eat meat and I do not) Mike does enjoy eating an abundance of fruit and vegetables. He will try anything that I make and loves to eat healthy. I agree that I am lucky – but his eating habits are one of the reasons that I fell in love with him in the first place. Right from our first few conversations I could tell that he cared about nutrition and fitness. When we first started dating he purchased a cookbook (which just so happened to be a Weight Watchers cookbook) and we would select dinners from it to prepare together. Two summers ago when Mike and I invested in a Vitamix blender, I had a marvelous time experimenting with different recipes. 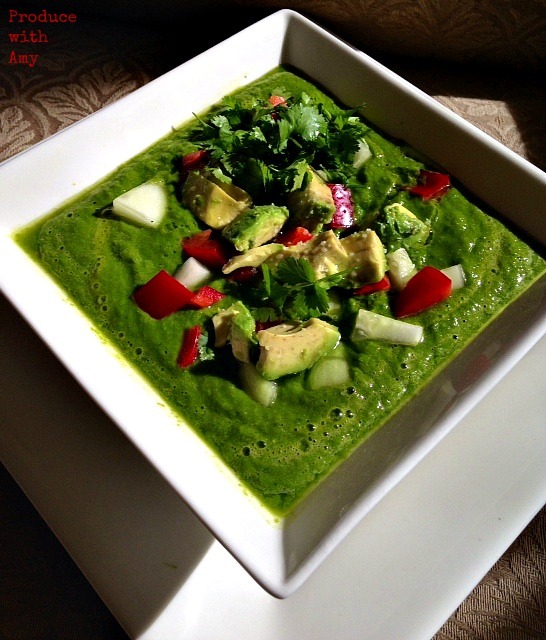 One of our favorite summer recipes is a raw, cold, green soup. 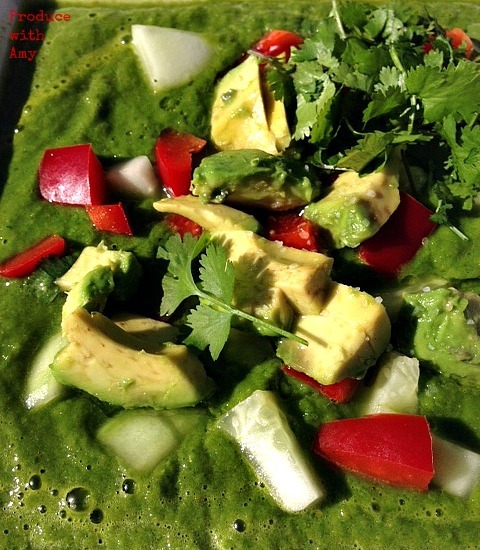 I suppose it could be called a green gazpacho – or a savory green smoothie – and I never make it the same way twice. 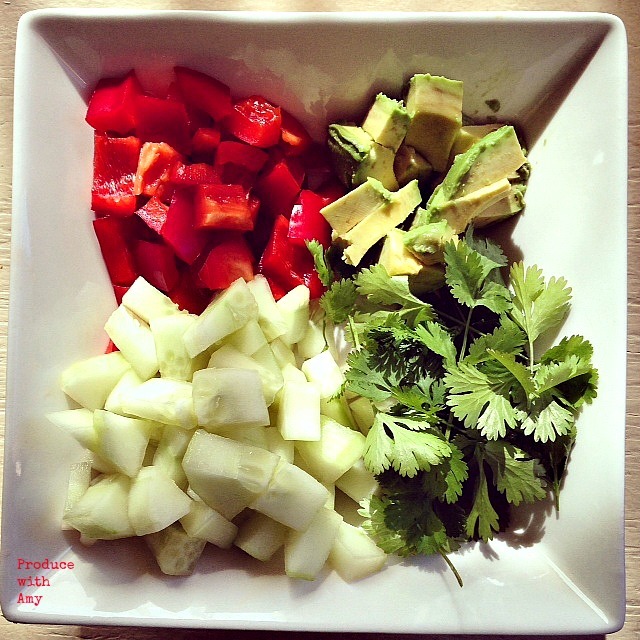 I love to add whatever produce that we have on hand and toss in a variety of fresh herbs from our garden. 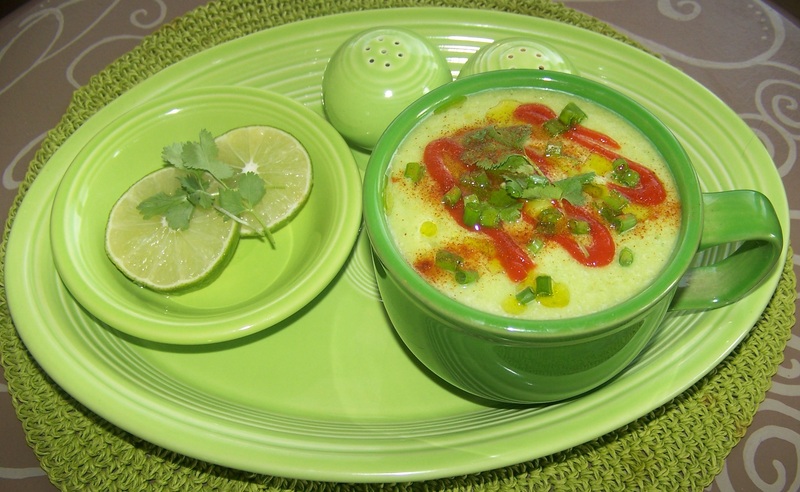 The result is a refreshing, filling, and healthy soup that serves as a great lunch or opening course for dinner. I normally make a bowl for each of us but I think that one could make a large batch of this soup and it would keep well in the refrigerator for a few days. 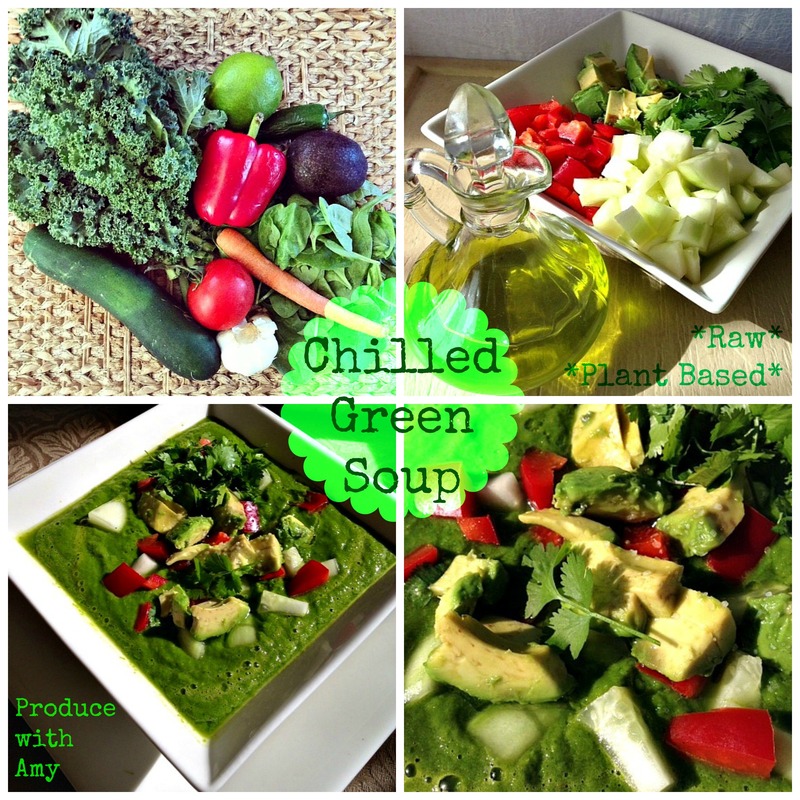 Not only are cold soups refreshing on a warm summer day but there are loads of health benefits from eating raw vegetables. One of the advantages of blending greens is that the blender breaks down the cell walls of the kale and spinach and the nutrients are easily absorbed by our body. In my Weight Watchers meetings we are always discussing new ways to consume more fruit and vegetables and a cold soup is a light and delicious way to do so. In this post I will share the recipe for the soup that I made for tonight’s dinner so you can create it yourself or tweak the recipe based on your personal tastes and what you have on hand. 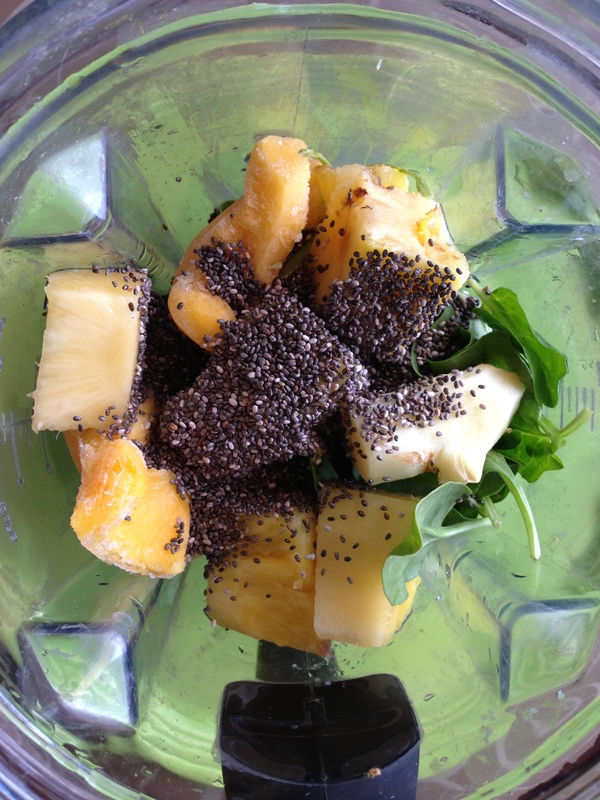 Add all the ingredients to the blender and blend until all ingredients are smooth. I have a high power Vitamix blender and do a quick blend for 45 seconds. Pour the soup in a bowl (if my ingredients are room temperature I like to let the soup chill in the refrigerator for 20-30 minutes before serving). 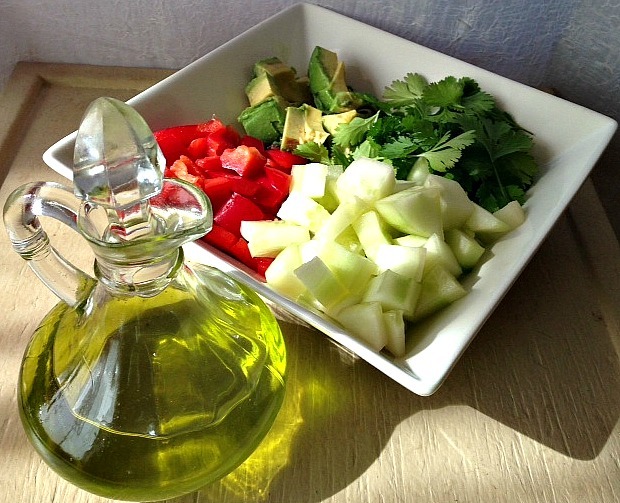 Add the cucumber, bell pepper, avocado to the top and drizzle with olive oil. I also like to sprinkle on a little coarse sea salt. 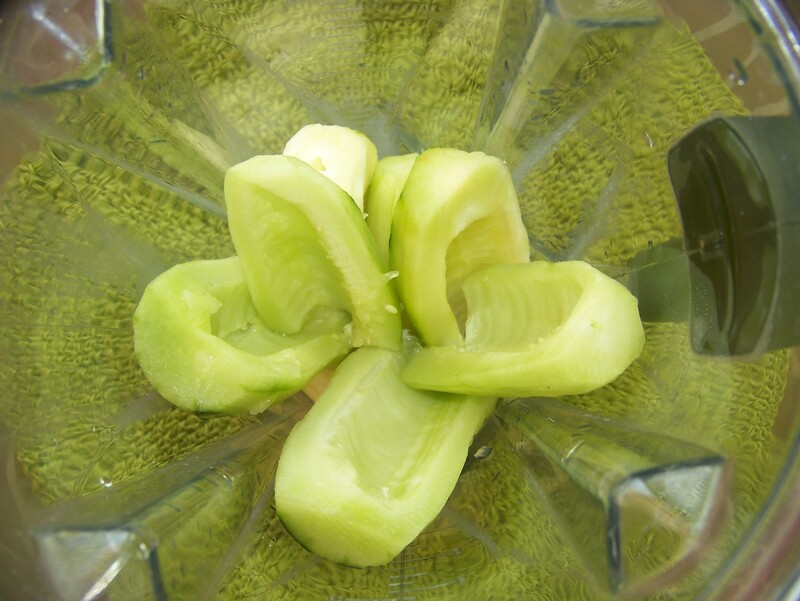 The color will be bright green and beautiful and it tastes as fresh as it looks. Cold soup is so simple to make and it is a great way to add more vegetables to your meal plan. Please let me know if you are interested and I will gladly come up with more flavor combinations. Think about a raw tomato, spinach, and basil soup with grilled corn added after blending. How about turnip greens with avocado, cucumber, and marinated mushrooms? Or spinach and garden peas with fresh mint and dill? 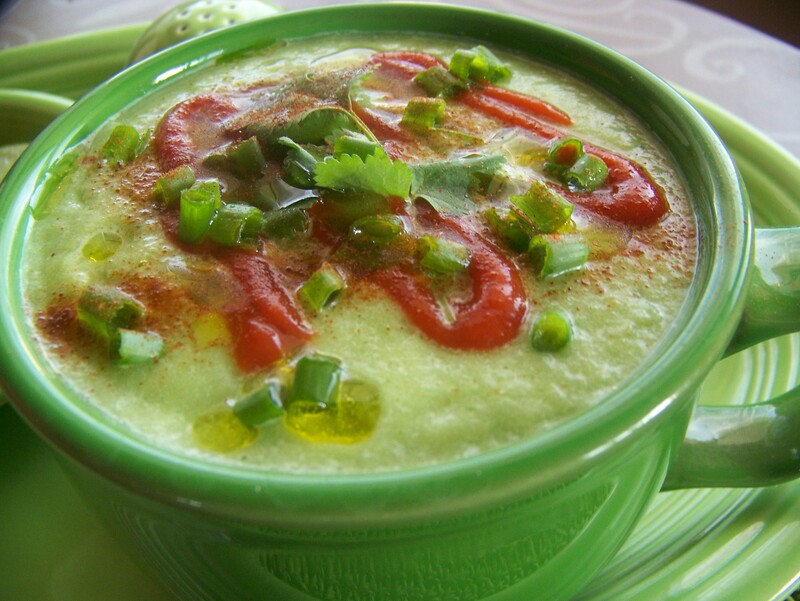 Maybe you have a favorite cold soup combination that you would like to share! 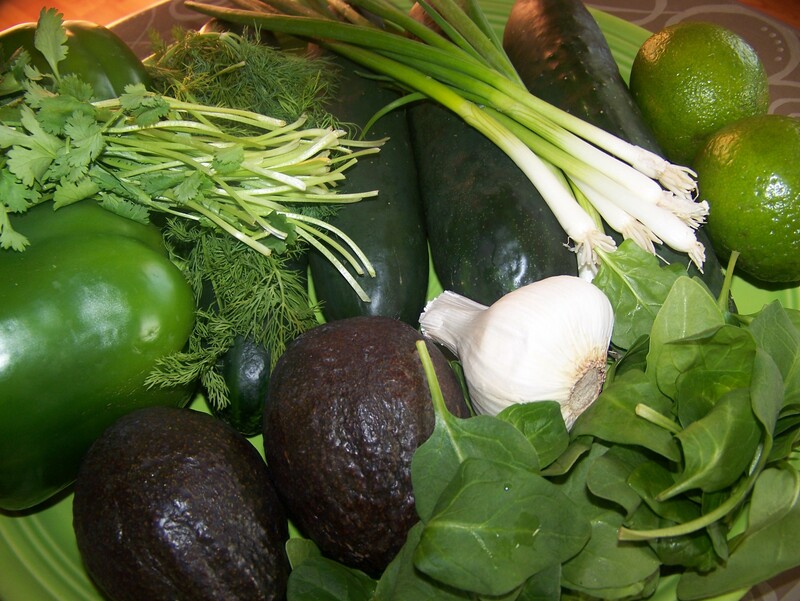 Over the next couple days I will be sharing weekly recipes and shopping lists for an August Green Smoothie Challenge. My hope is to have the recipes posted this weekend so that you can be prepared. You can use my recipes, or come up with your own. The goal will be to try to drink at least one green smoothie a day (Mike and I will be drinking ours for breakfast). 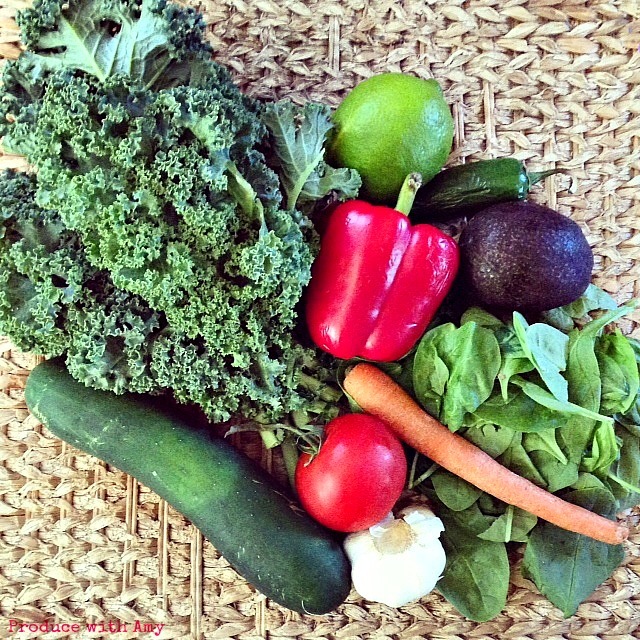 If you are new to green smoothies you may want to check out my post from last January: New Year’s Green Smoothie Challenge. We can keep each other updated on our favorite green smoothie combinations during August so please make sure to stop by my Facebook Page and give it a “like”. I will create a hashtag on Instagram too. In the meantime, please sign up for email updates of my posts. Follow me on Pinterest, Tumblr, Instagram, and Twitter and thank you for joining me on the journey to eat more fruit and vegetables. Cheers to our health! 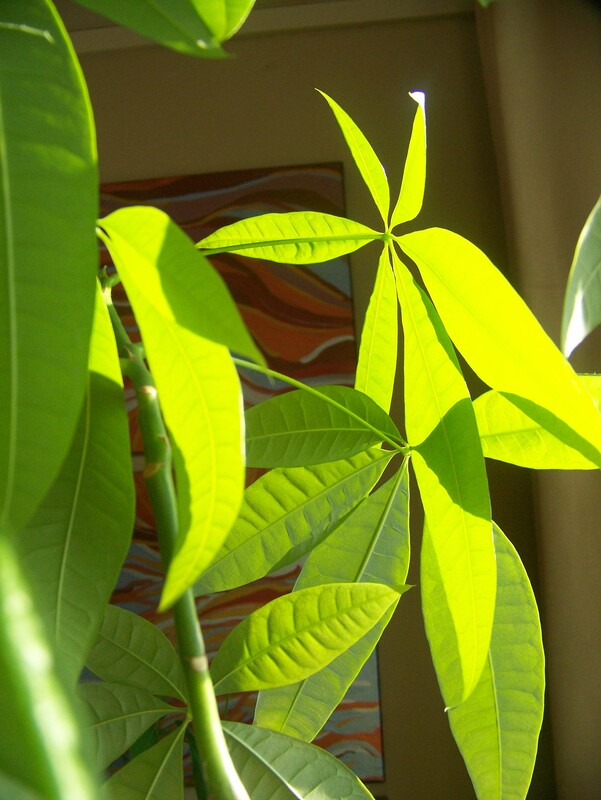 The sunlight filtered through the windows today and my houseplants were sponges as they soaked up the joyful rays. I felt like Pandora today. 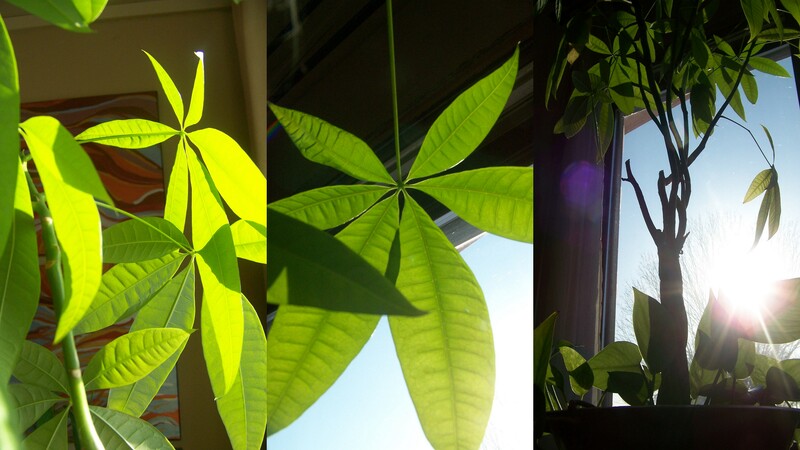 Sunlight streaming through the window, I grasped the jar full of hope, and imagined spring arriving. The snow banks in our yard range from three to ten feet in height, but we know that even in the Upper Peninsula of Michigan, spring is perennial and we will have our time to bask in the sun. Today is St. Patrick’s Day and like every other morning, Mike and I started the day with a green smoothie. I decided to make our routine festive and served up our healthy drinks in a pilsner glass. Today I made one of my favorite combinations: spinach, mango, pineapple, banana, lime juice, chia seeds, fresh ginger, and water. Cheers! Or as my friend Cavan taught me today, Sláinte! I love the ritual of making a green smoothie each morning. It makes me feel that we are starting the day out right. As my mom Karen taught me, presentation is everything. Sláinte! Who needs green beer when you have these nutrition packed drinks to fuel your day?! 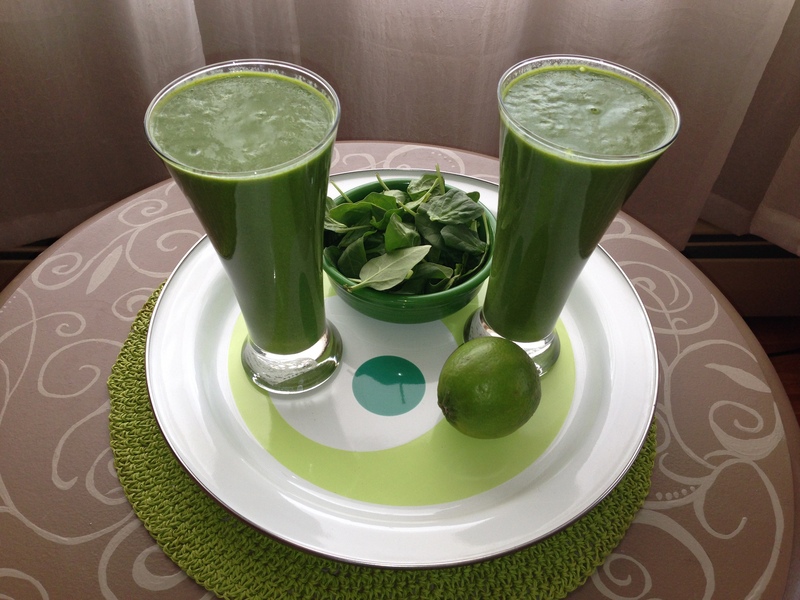 After Mike and I enjoyed our morning together, I posted the above photos on facebook and my friend Paula said she wished she could taste-test the green smoothies before venturing out on her own. 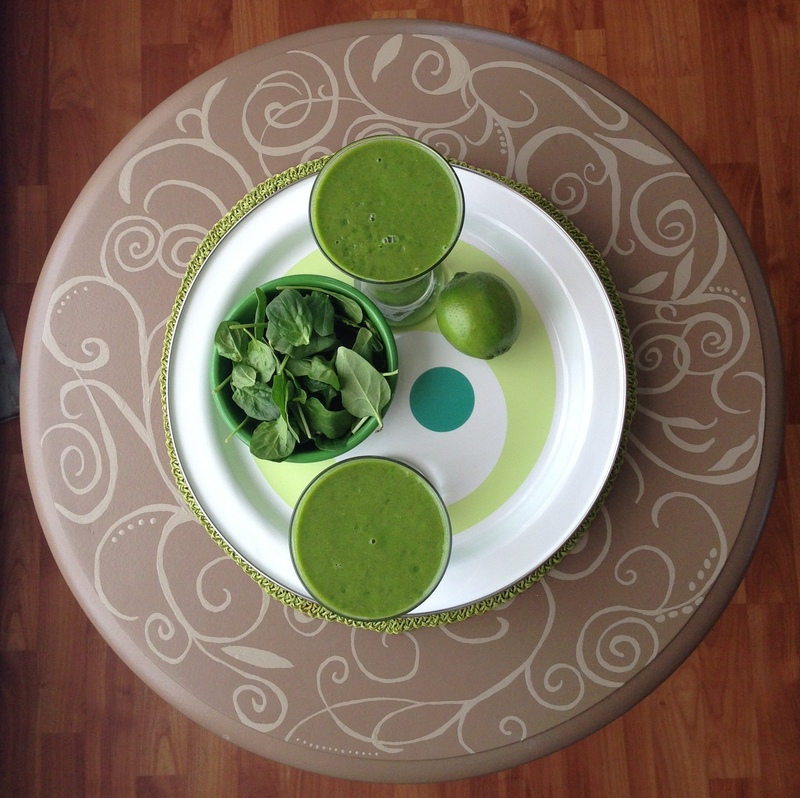 I have had many friends that, like Paula, have had trepidation over taking the green smoothie leap. My promise is always that they will love them (and 9 out of 10 tell me that they do). 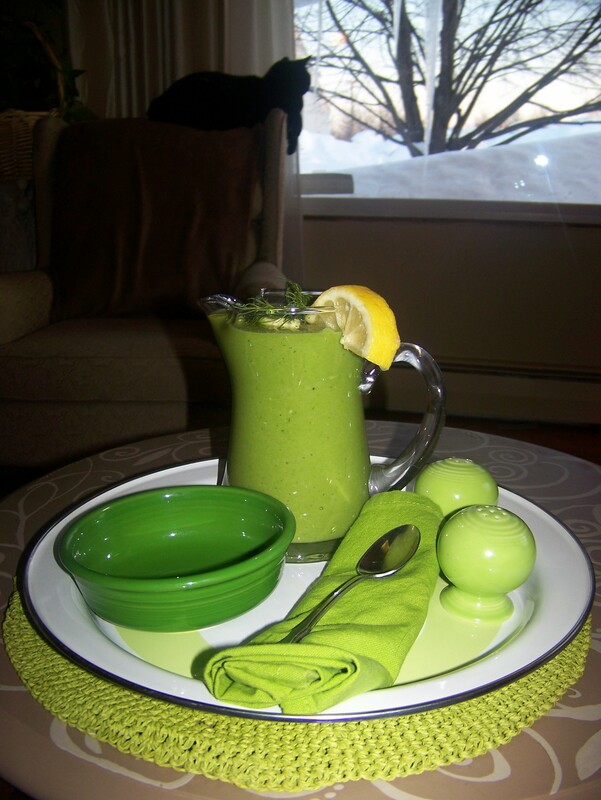 Paula also wanted to know if she needed a special mixer to make green smoothies and I assured her that for the first few years, I made ours with an inexpensive blender. (Though, of course, I recommend a Vitamix. It has been one of the smartest investments that we have ever made.) The trick to a great green smoothie, is first blending the water (or liquid of choice ) with the greens and then adding the fruit cut up into small pieces. Here was my message, verbatim, to Paula this afternoon: “My recommendation would be to start very simple. My first one was spinach, banana, strawberry, and water. Spinach is naturally sweet and you won’t believe how good it tastes. A frozen banana is key because it gives the smoothie sweetness and makes it creamy. I buy quite a few bunches of bananas a week and when they get ripe I peel and toss into a bowl or bag in the freezer. Some of my favorite combinations are: banana and blackberries. Peaches, banana, and raspberries. Mango, pineapple, and banana. Experiment with your favorite fruit. I’ve tried tons of different combinations and often toss in what I have on hand. Frozen fruit works well and makes the smoothie cold (though you can add ice as well). I’m a green smoothie “purist” and normally stick with water, fruit, chia seeds, and greens. The chia seeds make it filling and are a great source of calcium, protein, and Omega-3.Though I know that others add yogurt, milk and dairy-free milks, and even healthy oils. I cannot wait to hear what Paula, and her family, think of the green smoothies. Now that I have posted this here, she will have no choice but to experiment. 😉 Nothing makes me happier than getting feedback and learning new tasty combinations. Mike was busy this weekend with his studies and we decided to spend the weekend at home. 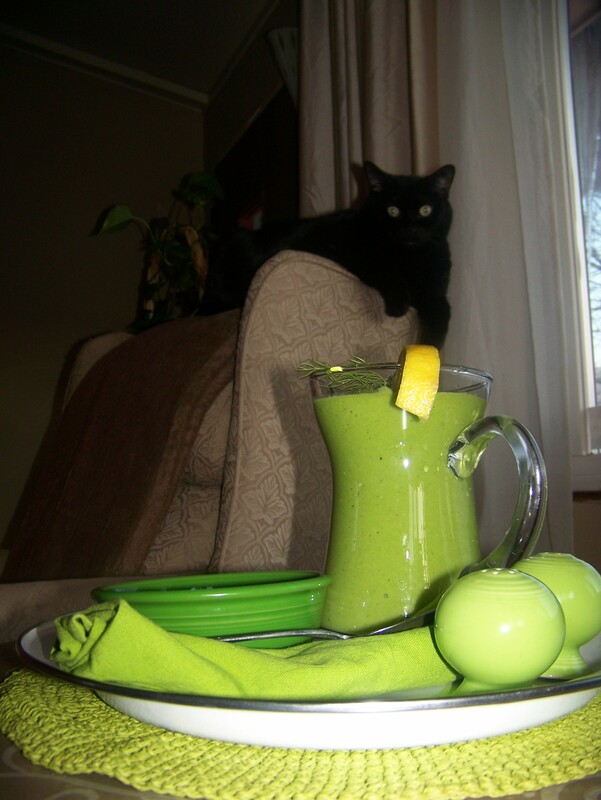 Still, I wanted to make the day special and try a new recipe to celebrate St. Patrick’s Day. Feeling wistful for spring, I imagined something light and refreshing to serve as a harbinger for warmer weather. 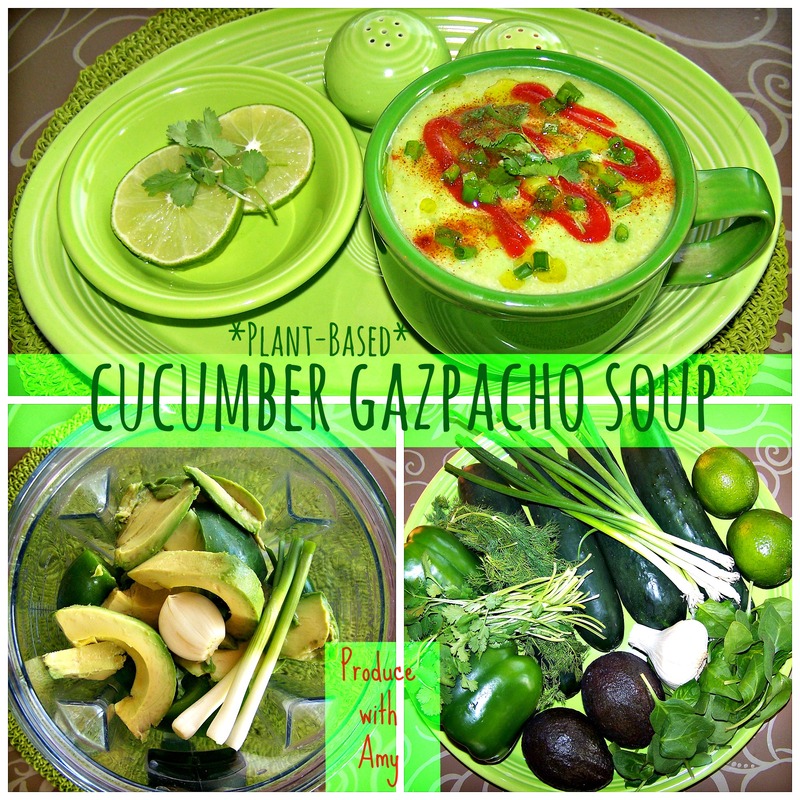 Last week I received an email from Veg News for a Green Gazpacho. The recipe was contributed by Patti Breitman and I thought it would be a perfect dish for today. Last summer, cold and savory green soups were one of our favorite dinners to beat the heat. 1. Set aside a few sprigs of cilantro for garnish. 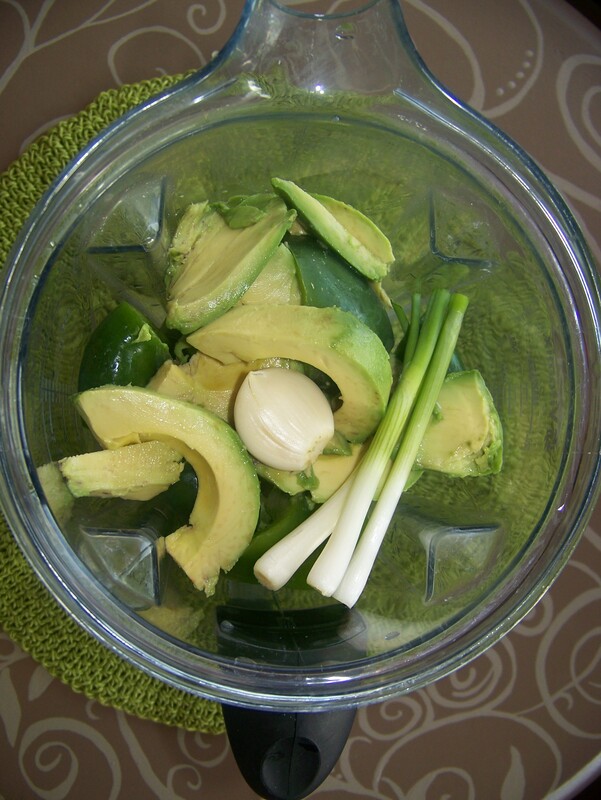 In a food processor, add cucumber, avocado, garlic, peppers, and green onions. Blend until creamy, adding water a little at a time to reach desired consistency.2. Add lemon juice, cilantro, salt, pepper, and cayenne. Serve with paprika sprinkled on top and cilantro for garnish. For our green soup, I decided to divide the recipe up into two batches. I followed the Veg News recipe but for the first batch I swapped out the lemon for lime and for the second batch I swapped out the cilantro for dill and added a couple handfuls of spinach. Both turned out fresh, light, and delicious! We ate the first batch tonight for dinner and the second we will have tomorrow evening. I will be making this again and I think it would be fun to experiment with different additions. 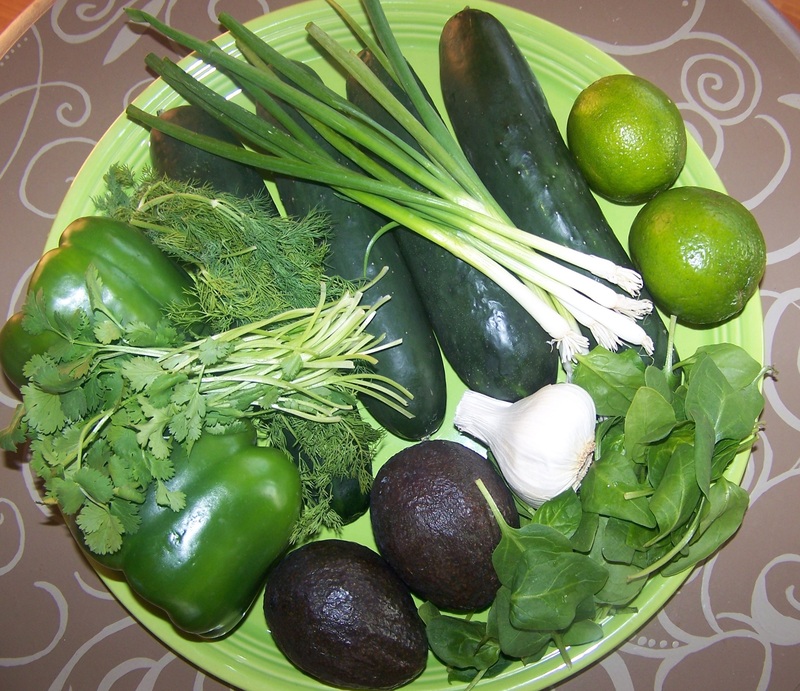 Jalapeno would be a great partner to the cilantro and chopped tomato or homemade salsa would make a vibrant garnish. Lacto Vegetarians could also finish off this soup by folding or blending in plain Greek yogurt for a protein boost. How can you go wrong with such a beautiful plate of produce? 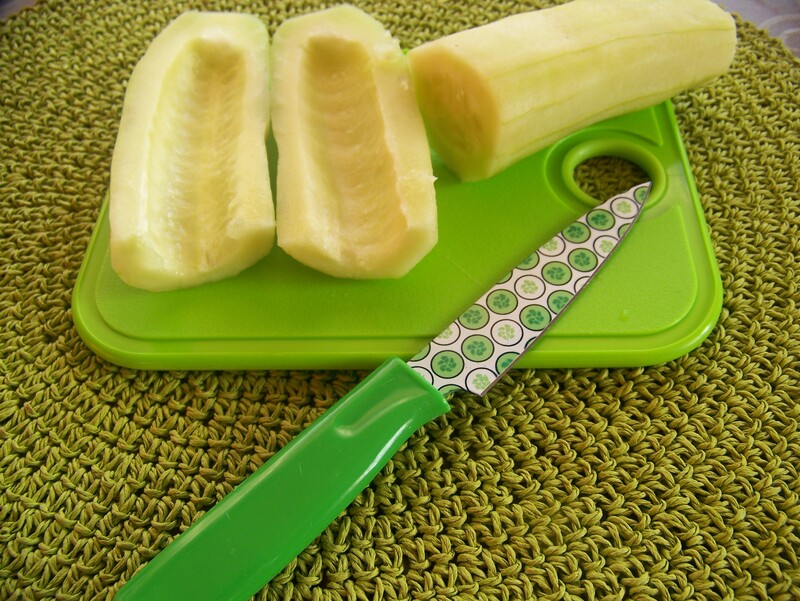 Slice the cucumber in half and scoop out the seeds with a spoon. I love the way this photo turned out. It’s like a spring, cucumber flower! Add the rest of the ingredients to the blender or food processor. 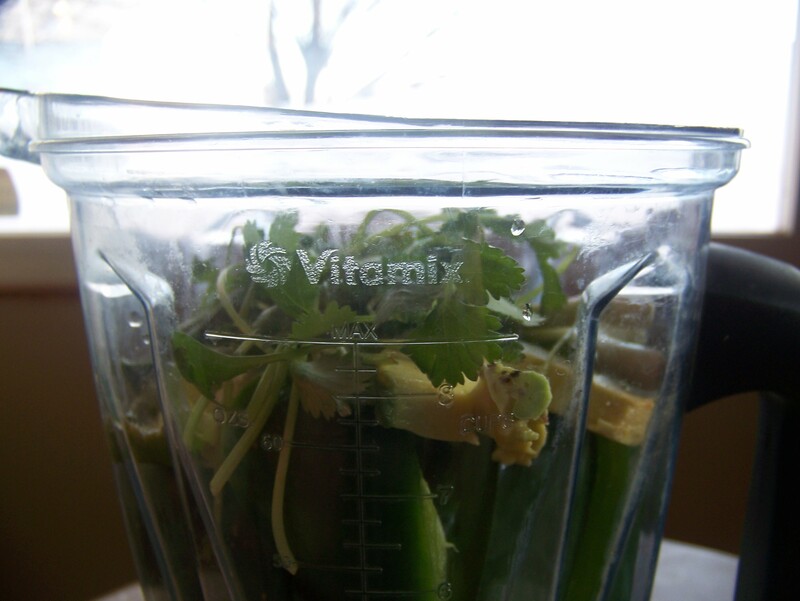 Since I used our Vitamix, I was able to leave the ingredients in large chunks. To finish, I drizzled with extra virgin olive oil, sprinkled with green onion, cilantro, and in honor of my friend Jessica ~ added a spicy kick with Sriracha sauce! The second batch turned out equally as beautiful and tasty! 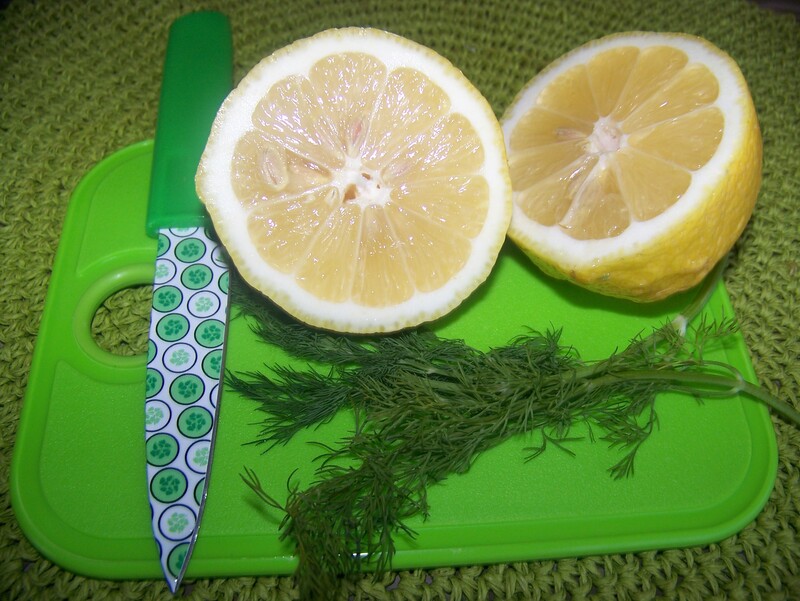 Lemon and dill is a incredible flavor combination. I cannot wait to have this for dinner tomorrow evening. Do not worry, I already sampled a small bowl. 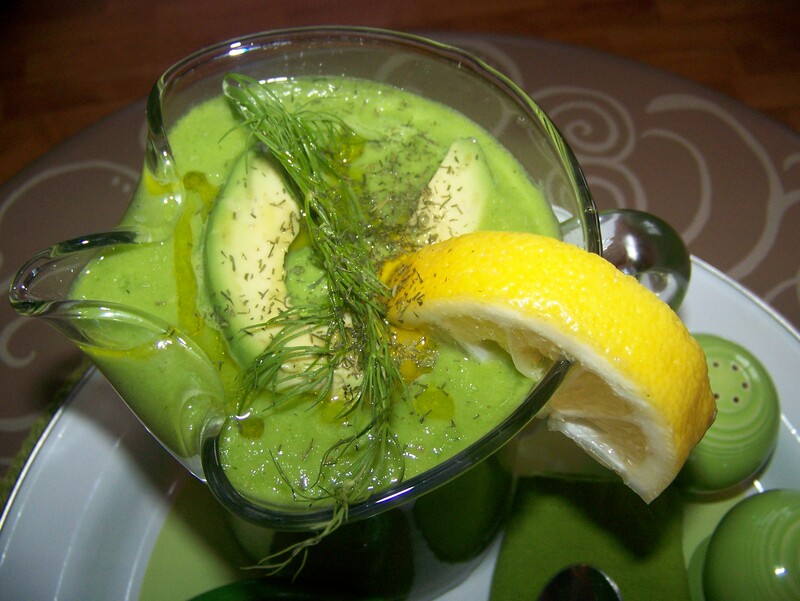 For this version of the chilled soup, I reserved some of the avocado to add as a garnish. I love the silky and luxurious texture of avocado. In the background our posh black cat, Pandora, pines for spring. Spring may be slow in arriving this year, but that does not have to stop us from making our own light. While I am waiting until my Spring Break to start the annual deep cleaning and organizing, I did a few things to add a bit of freshness to our home. A couple years ago Mike build me floating shelves out of reclaimed hollow core doors and I try to swap out the decorations with the seasons. I still had Valentine’s decorations up and decided to pull some of my vintage Chartreuse Fiestaware out of storage in the basement. It is amazing how something so simple can be uplifting to one’s spirit. I encourage you to try a new recipe or do something light and lively with the decor in your home. Grab your camera and record the way the sunlight sifts through bare branches or watch the way your pets delight in puddles of sunshine. Continue to dream and eventually spring will be here! Until then, make the most of today and enjoy every healthy moment.